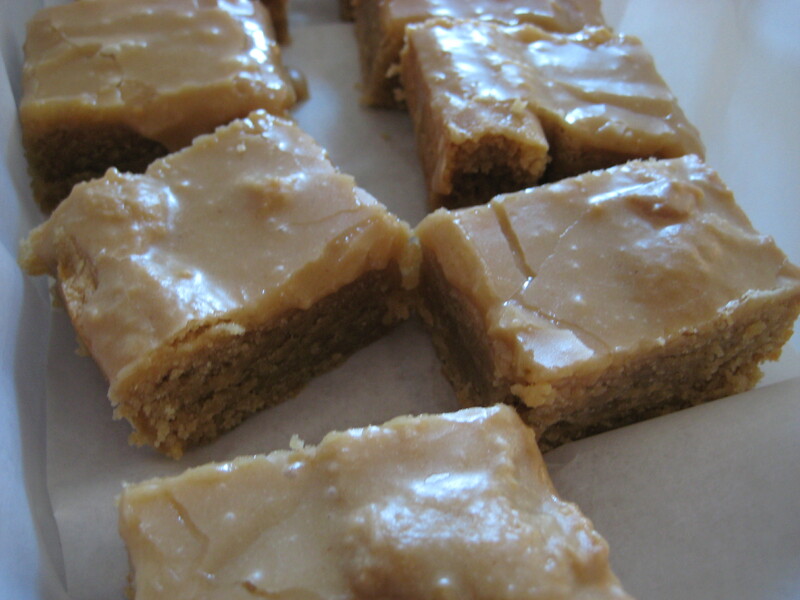 I finally found the recipe to recreate those yummy nostalgic peanut butter bars from back in my elementary school days. I didn’t like most of the things served on those cafeteria trays, but these were my favorite! I’m here to say that this recipe was tried and true by yours truly– a true copycat and I had to share. Enjoy! Preheat oven to 350 degrees and butter and line with parchment a 9X13 baking pan. Melt together butter and peanut butter. Set aside to cool to room tempurature. In large bowl, sift together sugars and salt. Whisk in one egg at a time until combined. Add-in vanilla. Whisk in peanut butter mixture until combined. Sift in flour and mix until flour just disappears. Pour into prepared pan and bake until tester comes out with moist crumbs (about 35 minutes). Milk (amount depends on desired thickness of icing–start with a couple of tablespoons and go from there). Once bars have cooled, flip out onto a cooling rack fitted into a cookie sheet (to catch the icing). Mix icing ingredients togther until of desired consistency. Drizzle over bars. Let icing set up and cut. These worked out great. The bars were just like I remembered them. (The icing was a little different.) Thanks for posting! Did you have those little tea cakes too? They were individual squares, kind of like a spice cake. Can’t find that recipe anywhere. I totally remember those cakes! But I think my elementary school palette didn’t appreciate them back then… glad the recipe worked out! Yes, it’s equivalent to 2 sticks of butter. IVE BEEN LOOKING FOR THIS RECIPE FOR YEARS.OMG..IM SOOOO HAPPY..THANKS!!!!!!! The bars I had in elementary school were not crunchy, but a little bit of crunchy goodness wouldn’t hurt! ;-) Enjoy the bars if you decide to try out this recipe – they’re pretty fabulous! Yo!!!!!! Wow!!! Thank you!! I remember these. Everyone loved these bars! I think they called them Yak Bars. Why Yak..Idk. I love them! I’m definitely making this! Yes they do have oats ,that is the little crunch to it . I use to make these in the school cafeteria,they have take it out because so many children have peanut allergy. To Lauren the yac bars have molasses and nuts and mincemeat mix and yes they are good.